Here’s a sweet-savory breakfast treat to enjoy on your flat-belly diet. This recipe for a Microwave Egg Sandwich has a surprise ingredient, strawberry preserves. If you want, add chopped spinach to the egg mixture to get your veggie servings at breakfast. If your morning schedule is hectic, wrap the sandwich in foil and eat as you go. Slice the English muffin in half and toast. Coat a microwave-safe coffee mug with cooking spray and crack the egg into the mug. With a fork, whisk the egg and sprinkle with cheese. Cover the coffee mug with a paper towel and place in the microwave for 60 seconds, or until cooked through. 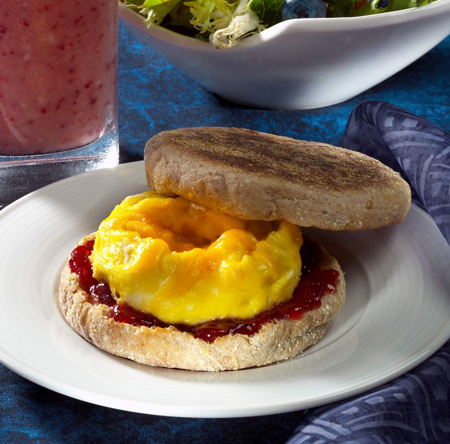 Smear the butter and jelly on the muffin, and sandwich the egg between both sides of the English muffin. Per serving: Calories 238 (From Fat 47); Fat 5g (Saturated 3g); Cholesterol 11mg; Sodium 503mg; Carbohydrate 36g (Dietary Fiber 4g); Protein 14g.